When transitioning from player to event holder, the event holding options available to you can quickly become overwhelming. Being able to narrow down the scope from completely pie in the sky ideas to something concrete is crucial. Usually this comes with time and practice, but there are shortcuts. Here are 7 types of battlegames you can use at an event to lay the foundation for role playing and interaction. Adding battlegames to a practice can create a framework on which you add role playing. The easiest way to do this is to group players into ‘Houses’. Have them build banners, then allow the Houses to make choices about which kind of battle they want to participate in. 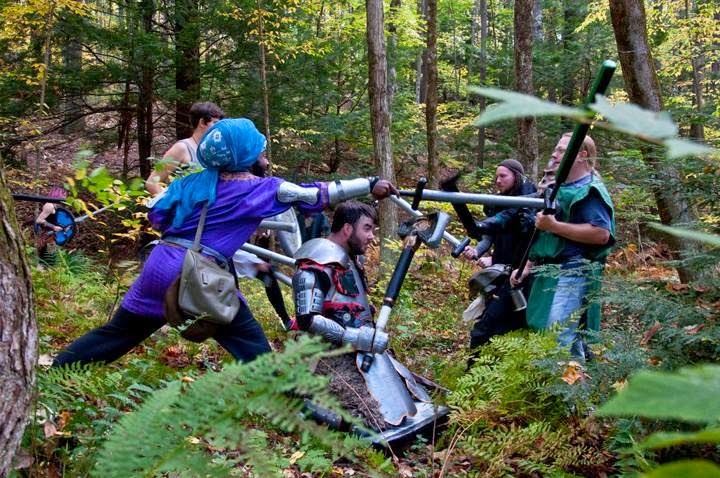 These battlegames are the basic idea behind running a 4x combat larp. This isn’t a comprehensive, just a place to start. These seven types of battles make up the primary game mechanic of the strategy layer or my 4x larp concept. But they can can be explained and run quickly in almost any larp. A quick note about setup. There are two battle types which require large scale props. Fort Battles have the most setup, which means it’s generally not well suited to your first event. Bridge battles can be as simple as rope pegged on the ground, or they can be physical load bearing structures. In a field, two opposing forces line up against each other. They close distance, then engage in combat. The winning side is the side with living players. Generally works best with 10+ players. Set up two flags at opposing ends of a large field, forest, or mixed terrain. Pick teams. Each team must retain it’s flag or they can win by killing the opposing team. Optional: Respawn and capture. This is closer to classical capture the flag. Get two lengths of rope. Tie them into two circles. Place each circle somewhere near the flag. Opponents placed in the circle cannot respawn, but can be rescued. Dead team mates placed in circle respawn after a set amount of time. Good with large areas, and large numbers of players. Assuming you do not have a river with a bridge, simulate one with colored cord or surveyors tape, and tent pegs. Lay out a river (usually blue cord) and land (green works well). Make sure that the land is wide on each end of the field (where each team starts) and narrows in the center. Depending on how many players there are on each side you may need to vary the size of the opening. Each force should not be able to stand next to each other and walk across the ‘bridge’. It should act a as bottleneck. Players cannot step in the ‘water’ area, or they are swept away and lost for that round. Can be added to Line Battle, or Capture the Flag. Good on a nice level field. Or in real terrain featuring a bridge and water. Set up similar to a line battle. Fought similar to a line a battle. The trees will act as natural barriers and uneven terrain makes an especially good woods battle. 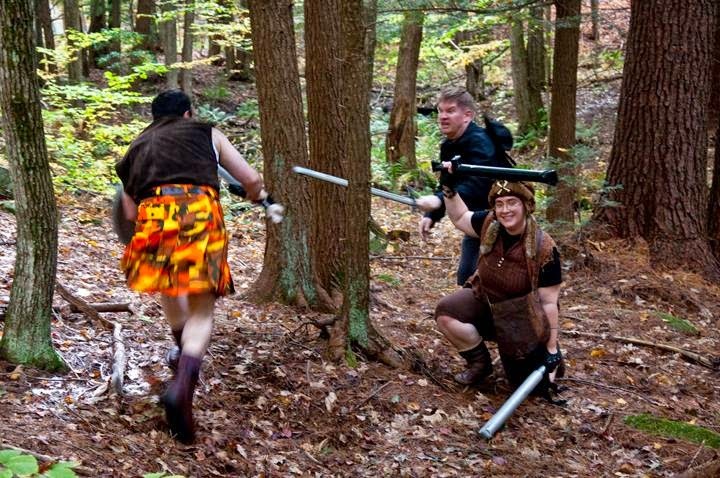 There is more physical danger to the combatants in this style of combat due to interaction with the terrain. Works well with any number of players. Select two forces, which do not need to be even in number. Find or establish a path or route through an area. One team hides in the area, or prepares an ambush. The other team is asked to carry an object, generally a heavy one, from one end of the path to the other. The name comes from using a full milk bucket, which is both heavy and messy (and very fun to watch players stumble around with). Set a minimum number of players needed to carry the object depending on how many players are available or how difficult the combat should be. Players carrying the object cannot engage in combat without first putting the object down. Works best in wooded areas and in conditions where the players moving the object cannot see the opposing force well. Works best when you have a physical structure, which unfortunately takes a lot of resources. Can be simulated with pallets, or tarps. Pick two groups of players. Place one group inside the structure. The second group attacks the structure. In theory you could lay out a structure in a similar manner to a bridge battle using surveyors tape or cord. This can be problematic in practice. In the heat of combat it’s very easy to forget where the ‘walls’ are, and how tall they are. Better to use an actual structure. Select two forces of equal size. Choose a terrain. Could be fields or woods. Although I’ve never attempted it on a bridge, that might be cool too. Select one member of one team and have them leave their weapons on the ground where their team starts. Place that person in the middle of the field. The side with all it’s members must prevent that person from getting back to the other side and retrieving their weapons. The side with it’s player in the center must get to that person and get them back to their weapons. The person in the middle cannot run until they get back to their weapons. They will not move unless accompanied by another player of their team. They will not move back to the center under any circumstances (the other team cannot take them back to the center). The success of the overall event itself is about how you string together these various types of battles and how you set the scene. With some narrative structure and interesting NPC’s who have unique garb, and interesting goals these simple battles can become a great event. Good luck and have a great time larping! Here is a big list of more types of battles for boffer combat. Do you have any battle types that you use on a regular basis? Any neat twists on the existing battles? You can tweet me. Or leave a comment via Google Plus. And finally you can find out if we’re practicing using these battles on our FaceBook group. This is really interesting. For a long time I’ve been playing with a group that almost exclusively do capture the flag style. I’m hoping to try and convince people to try something in a forested location, to create a fog of war element, and maybe allow teams to choose where they hide their flag. I’m also wondering if there’s some way in which puzzles could be included, something that a person could solve in order to gain a better weapon, or other advantage. I’m really looking forward to pitching some of these ideas to my group. Awesome, sounds like the post inspired you to try something different. Which is exactly what I was hoping for. If you are going to experiment with puzzles in battle games, I would look first to ‘stupid human trick’ type puzzles. Traps made out of red string, where the players have to contort themselves through a location. Ultimately a puzzle is going to enforce a ‘bottle neck’ on the players. That might work for a more narrative larp, like a hit point system, but might be problematic in a battle game. The pace would change abruptly when combatants run up against a puzzle. Maybe it the puzzle were optional, but presented a compelling reward (like you said). Not only does one team have to navigate a weird puzzle, they have to do it while being attacked by the other team. Maybe something like the bridge idea, or a series of widely spaced “safe” platforms, but otherror players are free to shoot at you, though I’m also wondering to what extent Legend of Zelda could be used as inspiration.